Management has settled an unfair labor practice charge filed with the National Labor Relations Board by Susan Morris (CDP-Brooklyn) that challenged management’s ban on use of the Society’s email system for Union email. This is the second recent victory for free speech at Legal Aid. On May 1, Seymour James upheld a grievance (endorsed by ALAA) challenging management’s email restrictions against Michael Letwin (CDP-Brooklyn) for sending a message entitled “Racial Justice Update: Black and Palestinian Lives Matter.” That decision was issued two weeks after the public statement In Defense of Free Speech at The Legal Aid Society (April 14, 2015), signed by 118 ALAA and 1199 union members. These victories show, once again, that we can successfully defend and exercise our rights. The next step is to ensure that management fully respects those rights by restoring ALAA’s longstanding, workplace-based email discussion list; lifting its prohibition on “unapproved” messages regarding Black Lives Matter and other social justice movements; and ending the indefensible discrimination that censors antiwar and Palestine human rights advocacy, while turning a blind eye to all manner of other “non-work” messages. 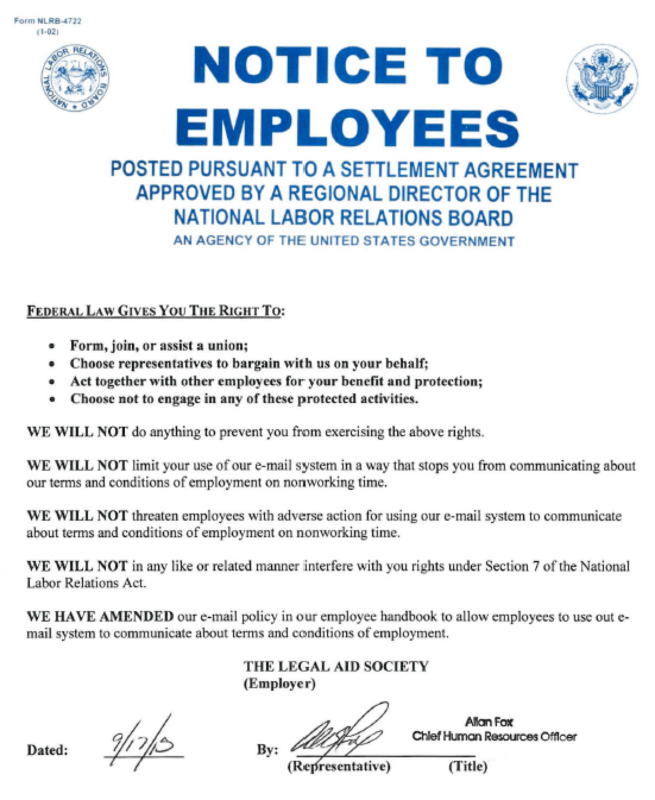 We are notifying you of an amendment to our e-mail policy pursuant to a Settlement Agreement Approved by the Regional Director of Region Two of the National Labor Relations Board in Case 02-CA- 148285. The amendment conforms our e-mail policy to recent decisions of the Board. A copy of the revised policy may be found on LASnet hereand at pp. 41-44 of the Employee Handbook. Susan- this is precisely the type of email that I indicated is a violation of the policy. You have already been spoken to about this by your supervisors. Should you continue to use the email in this way, your use of all distribution lists will be suspended. Sent from my iPhone. Apologies for any typos. Long gone are the days when anyone with a union card has a voice in LAS. Seymour James has upheld a grievance (endorsed by ALAA) challenging management’s email restrictions on Michael Letwin (CDP-Brooklyn) for sending a message entitled “Racial Justice Update: Black and Palestinian Lives Matter.” The decision (see below) was issued two weeks after the public statement In Defense of Free Speech at The Legal Aid Society (April 14, 2015), signed by 118 ALAA and 1199 union members. This decision cites management’s failure to decide the Mass Free Speech Grievance (July 15, 2014), signed by 173 ALAA and 1199 members (and endorsed by ALAA). It also acknowledges that, under Purple Communications, 361 NLRB No. 126 (2014), union members cannot be prohibited from using LAS email to communicate about “the terms and conditions of employment [and] protected concerted activity.” However, the decision does not address the longstanding pattern of discrimination against antiwar and Palestine human rights advocacy at Legal Aid. As “we stand together” for a fair contract, let’s continue to stand up for our vital free speech rights at the workplace. On June 25, 2014, you sent an email to all ALAA and 1199 staff on The Legal Aid Society’s email system with the subject line: “6pm Today: Emergency Rally: Stop Israeli Crimes in Palestine.” This e-mail was not related to any business purpose of the Society, nor did it relate to any term or condition of employment or other protected concerted activity under Section 7 of the NLRA. On June 26, 2014, you were directed by Allan Fox, the Chief Human Resources Officer, not to send any non-work related emails over The Legal Aid Society’s email system. In response to this directive, you filed a grievance on July 15, 2014, contending that the email was protected under ALAA Collective Bargaining Agreement (CBA) §3.5 (“Free Speech”) and §1.5 (“Union Activities”). Section 1.5 of the CBA provides that the Union will have reasonable use of the Society’s internal communication mechanisms. “Reasonable use of the Society’s internal communication mechanisms shall be interpreted to mean the following: The Legal Aid Society will maintain an e-mail group that permits the President of ALAA and her designee to send communications to all ALAA members and permits individual members to respond to the President of ALAA and her designee as the sender(s) and not to the whole e-mail group. The Legal Aid Society has provided ALAA with a one-time payment of $12,000 so that ALAA can develop and implement a free-standing e-mail group of ALAA members that is not on The Legal Aid Society’s computer network.” Your email was not one sent by the President of ALAA or her designee pursuant to this provision, and therefore § 1.5 of the CBA is not implicated. Section 3.5 of the CBA protects the expression of personal religious, political, social, and economic beliefs. However, it does not confer the right to utilize the business equipment of the Society to communicate those beliefs except to the extent related to terms and conditions of employment or protected concerted activity. Non-work related, non-Section 7 protected emails may, subject to ALAA’s internal procedures, be sent on the free standing email group of ALAA members that is not on the LAS computer network. The email you sent on June 26, 2014 was not related to any business purpose of the Society, nor was it related to terms or conditions of employment or any other protected concerted activity at The Legal Aid Society. Accordingly, your grievance of July 16, 2014, is denied. On March 6, 2015, you sent an email using Legal Aid’s email system to the CRIMIMAL PRACTICE ALL, CIVIL STAFF ALL, JUVENILE ALL, and all 1199 Members e-mail groups . Under the banner “Labor for Palestine” and “Tell New York City Council Members: DON”T TOUR APARTHEID,” the e-mail urged: “Please Sign: Labor for Palestine to NYC Council Members: Don’t Tour Apartheid Israel.” This email did not relate to any business purpose of the Society, nor did it relate to any term or condition of employment or other protected concerted activity. Later on that same date, you received an email from Tina Luongo stating that despite prior warnings, your email violated the Society’s e-mail policy. She further stated that in light of your disregard of prior warnings, your use of Outlook Distribution Lists will be limited for a six month period effective Monday, March 16, 2015. She further stated that subsequent violations will result in further limitations in your use of Distribution Lists and may result in disciplinary action. You filed a grievance on March 6, 2015, based on your prior grievance of July 15, 2014. During the grievance hearing on March 31, 2015, you requested that the email and the discipline restricting your use of the distribution lists be rescinded. You claimed that the email limitation was a denial of your free speech rights and violated §3.5 of the ALAA agreement and the right to engage in activity under Purple Communications. You further contended that there was lack of notice and therefore lack of good cause for the discipline. You argued that because you had not received a response to the July grievance, the issue had not been resolved, the notice was deficient and the disciplinary action restricting your use of the distribution lists did not constitute progressive discipline. After giving consideration to your argument, I find that the email of March 6, 2015 was neither work-related nor related to any term or condition of employment or other Section 7 protected activity. Therefore, Ms. Luongo’s response to your email did not violate the holding in Purple Communications. However, because the stated basis for Ms. Luongo’s temporary restriction of your use of Outlook Distribution Lists was your disregard of prior warnings, and because the July grievance concerning one such prior warning was not decided at that time, I am rescinding on that ground that portion of Ms. Luongo’s decision that temporarily restricts your use of Distribution Lists. Please be advised that your use of Outlook distribution lists for communications that are neither work-related nor encompassed within Section 7 protected activity may subject you to discipline and restriction of your access to Legal Aid Distribution Lists. Additional individual endorsers from both ALAA and 1199 will continue to be listed below. The undersigned members of the Association of Legal Aid Attorneys/UAW Local 2325 and 1199SEIU Healthcare Workers East hereby join in grieving Legal Aid Society management’s attempt to ban “non-work-related matter involving the current situation in the Middle East,” as reflected in the two warnings (attached below), concerning messages to the ALAA email discussion list. This censorship is just the most recent reflection of more than twelve years of pandering to complaints and threats by those seeking to silence antiwar and Palestine human rights opinion at Legal Aid. Regardless of our individual political views, the targeted speech — like earlier opposition to racial segregation, the Vietnam War, or South African apartheid — is protected under ALAA Collective Bargaining Agreement §§ 3.5 (“Free Speech”) and 1.5. (“Union Activities”), and under relevant 1199SEIU contractual provisions. In addition, such discrimination contributes to a broader hostile work environment for Arabs, Muslims, Palestinians and other people of color, in violation of ALAA Collective Bargaining Agreement § 3.1.1. (“Non-Discrimination”), CBA § 3.1.2. (“Affirmative Action”), relevant 1199SEIU contractual provisions, and Title VII of the Civil Rights Act of 1964, 42 U.S.C. § 2000e et seq. It is irrelevant that ALAA has agreed to eventually relocate its discussion list from the Society’s email system. As long as the current list exists, management may not selectively censor particular views or entire topics, while at the same time turning a blind eye to innumerable political and “non-work-related” messages — often sent by the very same list members who demand censorship of others. There is no “heckler’s veto” or “Palestine exception” when it comes to free speech. Moreover, since recipients can easily delete, or configure their individual Outlook settings to automatically “opt-out” of, Palestinian rights (or any other) messages, management may not engage in selective censorship under the guise of additional, unfathomable, unspecified “op-out” procedures. We call on management to rescind this ban, and respect our free speech rights. (Don’t cheat — you probably know the right answers* anyway). I. They really don’t like to hear. J. All of the Above. A. You really don’t like what someone else says or does at work. A. Tillikim and the other Whales at SeaWorld (e.g., Edda Ness, 3/3/10). B. Public Petition to Support Qing Wu (Christine Bella, 3/1/10). C. Contacting Your Representatives on Health Care Reform (Debbora Gerressu, 2/22/10). D. Food for thought, the next time you think of spending any of your money at Whole Foods (David Affler, 2/6/10). E. Cocktail Reception to Raise Funds for the Victims of the Haitian Earthquake – 2/4/10 (Allen Popper, 2/2/10). F. A bit of wisdom from Sarah Palin (Jeffrey Bloom, 11/19/09). G. RE: Ted Kennedy has Come and Gone (Sam Roberts, 8/26/09). H. Queens Charter Event 5-13-09 (Mary Anderson, 5/8/09). B. Selectively block messages from the sender and/or about that topic. C. Express your own opinion. D. Whine loudly until management agrees to selectively censor the union e-list. E. A, B and/or C.
5. Since “New ALAA Email Policy” went into effect on October 7, 2009, there have been at least 555 “non-work” messages — not one of them sent to a specially created group. 7. Since everyone has the option to selectively ignore and/or block unwanted messages, we can reasonably infer that the real purpose of selective censorship is to inhibit criticism of Israel’s treatment of the Palestinians. A. Have confidence in their own position. B. Lack confidence in their own position. A. Yes, I agree with Dr. King’s philosophy. 10:It’s not about Dr. King, it’s about us. The attached Word document provides background and context in opposition to the proposed surrender of free speech rights on the union email lists, which is scheduled for a vote at this Thursday’s Joint Council meeting. Decades of free speech rights at Legal Aid are under serious attack. On its face, the threat comes from management’s attempt to ban free speech on the union email list, and a parallel ban against postings on the outside of doors to internal offices and workspaces. But according to management and ALAA leaders, the driving force behind these policies are demands by union members and others to censor speech critical of U.S./Israeli policies. The union has previously voted to grieve such email restrictions. But now, to avoid arbitration, union leadership advocates a “compromise” (attached) that, citing the very management policies in dispute, prohibits discussion on the union email list, and offers no free speech protection on “personal” email groups. For the reasons below, the undersigned urges all members—regardless of political opinion—to direct union representatives at the September 17 Joint Council to vote against surrendering free speech rights at Legal Aid. ALAA’s Collective Bargaining Agreement provides unambiguous protection for free speech: “The expression of personal religious, political, social or economic beliefs of each and every attorney is fully guaranteed.” § 3.5. In that spirit, the Society joined ALAA and 1199 to defend attorneys’ right to wear “Ready to Strike” buttons in court, Frankel v. Roberts, 165 AD2d 382 (1st Dept. 1991), and to challenge the Giuliani administration’s retaliation for the 1994 strike. The CBA also provides that, “The Union will have reasonable use of the Society’s internal communication mechanisms.” § 1.5. For decades, the union and its members have exercised that right through access to LAS bulletin boards, individual office doors, staff mailboxes, telephones, fax machines, and/or conference rooms. This discourse has often included controversial political speech. By the late 1990s, discussion had largely migrated to the Society’s email system. In 2000, management established union email lists. Recognizing that free speech is essential, most members have debated, blocked or simply ignored content they dislike. The following details the progression of censorship at Legal Aid since 9/11. *October 26, 2001. Allen Popper (then ALAA Vice-President for CDD-Queens) unsuccessfully demands that the United Auto Workers remove ALAA president Michael Letwin for his vocal leadership of New York City Labor Against the War (NYCLAW), which opposes the Bush administration’s post-9/11 policies. *October 28, 2001. ALAA’s citywide officers refute false claims that, in opposing the war, Letwin has purported to speak on behalf of the union. *February 21, 2002. After five months of obstruction by Popper and others, the ALAA Delegate Council overwhelmingly condemns the Bush administration’s attack on civil liberties and immigrant rights. *June 13, 2002. Management unsuccessfully tries to impose a unilateral ban of all discussion on the union e-mail lists. *2003-2006. Popper and other members—while posting their own political or other “non-work” messages—reportedly continue to demand that management ban messages critical of the war and/or Israel. *July 2006. Popper (now in CDD-Brooklyn) files a grievance about an allegedly “anti semetic [sic] flyer” left on his desk. The grievance is denied. *June 12, 2007. Management and union leadership says that Popper, other unidentified union members, and/or the Anti-Defamation League of B’nai B’rith (ADL) have threatened to contact the City Council about “anti-Semitic” Antiwar Bulletins posted on the union email lists. As a result, management tells Letwin not to post any messages about Israel or Iraq. *October 28, 2008. Management says that, in response to complainants that management would not identify, Letwin must remove a “Free Palestine” sticker from his office door. Brooklyn CDD members protest this policy by posting various materials on their own office doors, in response to which management suspends its order pending arbitration of the overall speech ban. *January 13, 2009. Forty-four ALAA and 1199 members (many of them Jewish) issue a statement condemning Israel’s attack on Gaza. Management receives additional censorship demands. *May 12, 2009. After extensive discussion, Brooklyn CDD ALAA proposes an Open Letter to Steven Banks: Defend Free Speech at Legal Aid (below*), which is designed to enlist members in a campaign to have the free speech ban withdrawn, before ever reaching arbitration. ALAA’s Executive Board rejects Brooklyn’s proposal as needlessly provocative to management, unpopular with members and insulting to union leaders. The leadership has yet to inform all members of the history and context of management’s censorship plans. *August 2009. Union leaders criticize the targeted political speech as “divisive,” and argue that “we have no choice” but to accept management’s “compromise” that forbids collective discussion on union email lists. *September 17, 2009. ALAA Joint Council to vote on management’s free speech ban. For the reasons below, the free speech ban is just plain wrong. *As Brooklyn CDD union representatives (both supporters and opponents of Israeli policy) have pointed out to management, antiwar and “Free Palestine” opinions are—like earlier demands to “Free South Africa”—clearly not ethnic slurs, but protected political speech. *Accepting such a content-motivated speech ban—without even a fight—would make us complicit in the very post-9/11 witch-hunting, Islamophobia and erosion of civil liberties ALAA has previously vowed to oppose. It also invites demands for givebacks in other areas, of which there have already been many. *Surrender to a ban on email discussion (or posting on office doors) won’t resolve this issue. Those of us who are against the war and who support Palestinian rights will employ other forms of speech at the workplace and on newly established off-site union lists. What happens when the censors try to silence that free speech? *The “compromise” isn’t. It simply tracks a speech ban that blatantly violates our contractual rights. *By taking the moral high ground, a public membership-based campaign, with support from civil liberties and community allies, can effectively generate pressure on management to withdraw its free speech ban—without ever going to arbitration. The undersigned ALAA and 1199 members at The Legal Aid Society in New York City are alarmed and disappointed by your attempt to undermine our longstanding free speech rights by seeking to prohibit posted materials on individual office doors and to abolish collective discussion by union members on the Legal Aid email system. The new policy violates ALAA’s Collective Bargaining Agreement, which provides that “The expression of personal religious, political, social or economic beliefs of each and every attorney is fully guaranteed,” and that “The Union will have reasonable use of the Society’s internal communication mechanisms.” §§ 3.5, 1.5. The policy also betrays decades of past practice and fundamental democratic principles. Moreover, it would have a devastating effect on our individual and collective ability to function as union members. It is especially reprehensible that the new policy reflects an ongoing attempt to silence particular political opinions. Regardless of whether we agree with those viewpoints, attempts to chill their expression — either directly or indirectly — are an indefensible attack on the rights of all union members. We expect you as Attorney-in-Chief to stand up for free speech at The Legal Aid Society by withdrawing this new policy, and look forward to your prompt reply. Legal Aid Society Employee Handbook (July 1, 2007), at 31-36, http://lasspwebteam.legal-aid.org/HR/Policy%20and%20Procedures%20docs/Microsoft%20Word%20-%20LASHandbook%20sept%202008.pdf. Rather than continuing to enumerate each and every type of rapidly changing communications technology, § 1.5 was shortened to its current overarching language. NYCLAW’s initial statement of September 27, 2001 was ultimately signed by 1,254 trade unionists, including fifty-eight union presidents (three from the UAW); fifty-eight ALAA members; and twenty-three Legal Aid 1199 members. 9.11 5th Anniversary: NYC Labor Against the War(9.27.01), http://nyclaw01.wordpress.com/2006/09/10/911-5th-anniversary-nyc-labor-against-the-war-92701/. Michael Letwin, George Albro and Charlotte Hitchcock, Labor Against the War Statement(October 28, 2001), http://nyclaw01.wordpress.com/2001/10/28/labor-against-the-war-statement-re-alaauaw-local-2325/. See also, Zuss: 9/11 and NYC Labor Against the War (NYCLAW), http://bobzuss.wordpress.com/2007/05/31/september-27-2001-nyc-labor-against-the-war-nyclaw/; Michael Letwin, Support for UAW Local 2325 Antiwar Resolution (April 14, 2003), http://nyclaw01.wordpress.com/2003/04/14/support-for-uaw-local-2325-antiwar-resolution/. “As a labor union whose members fight each day for the statutory and constitutional rights of indigent New Yorkers, The Association of Legal Aid Attorneys, UAW Local 2325, is deeply opposed to the Bush administration’s broad assault on precious civil liberties and democratic rights.” In Defense of Civil Liberties, February 21, 2002, http://www.nacdl.org/public.nsf/ENews/2002e30?opendocument. The ADL routinely brands as “anti-Semitic” supporters of Palestinian rights (including those who are Jewish). Its recent targets include Nobel peace laureates Jimmy Carter, Arch-Bishop Desmond Tutu, and former UN Secretary-General Kofi Annan; United Nations Special Rapporteur Richard Falk; former Irish President and 2009 Medal of Freedom recipient Mary Robinson; Mahatma Gandhi’s grandson; former US Congress Member Cynthia McKinney; university professors; and trade unionists. Last month, for suggesting modest limits on illegal Israeli settlements, the ADL fired warning shots across Barack Obama’s bow. Antiwar Bulletins and other materials continued to be posted by Letwin and others, including Antonia Codling (July 2, 2007), Noha Arafa (September 10, 2007), Azalia Torres (October 23, 2007), Julie Fry (March 21, 2008), and Marisa Benton (April 15, 2008). Legal Aid NYC Union Members: Stop Israel’s Massacre in Gaza and End the Siege Now(January 23, 2009), http://laborforpalestine.wordpress.com/2009/01/13/legal-aid-nyc-union-members-stop-israel%E2%80%99s-massacre-in-gaza-and-end-the-siege-now/. See, e.g., Bob Zuss and Susan Morris, Vote No (December 13, 2004),http://bobzuss.wordpress.com/2004/12/13/vote-no/ ; Michael Letwin, The Real Issues in This Election (May 16, 2007), http://bobzuss.wordpress.com/2007/05/16/the-real-issues-in-this-election-michael-letwin/ .